Come make your Saturday Night an experience of a lifetime. The DTR Full Moon Night Trail Run will make you tackle a challenging 10 miles through the flat pinewoods of Jonathan Dickinson State Park. This park teems with wildlife in 13 natural communities, including sand pine scrub, pine flat woods, mangroves, and river swamps. There is something addicting about running through the night as you are completely disconnected and focused just on what your headlamps allow you to see. With 4 aid stations filled with expert trail runners guiding and helping you endure this epic night run. At the finish, we will celebrate with friends, stay and enjoy a cold beer and burrito on us. 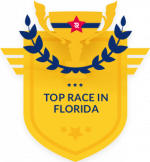 This Epic Summer Race was sold out in 2014, 2015 and 2016, & 2017 don’t miss out, spots are limited. Free Burritos / Free Beer / Free Party! We don’t want you to grab your medal and leave, so stick around and celebrate with hundred of new friends your accomplishment with complimentary Burrito, Beer and Music for some good vibes to complete the party! This trail race starts at 8 pm and will be fully marked by reflective arrows, ribbons and by the lights of a stunning Full Moon turning your race into a complete natural adventure. We employ the same safety procedures for our ULTRA-TRAIL events, including complete aid stations, experienced trail-running volunteers and full medical and emergency staff. We will have course marshall on bikes and a trail sweeper following in the last person. Bright colored apparel, flashlights or headlamps are REQUIRED. There is nothing more challenging, exciting and satisfying as trail running at night, and, there is no better event than DTR Full Moon Endurance Challenge. Located just south of Stuart, this park teems with wildlife in 13 natural communities, including sand pine scrub, pine flat woods, mangroves, and river swamps. The Loxahatchee River, Florida’s first federally designated Wild and Scenic River, runs through the park. Ranger-guided tours of the 1930s pioneer homestead of Trapper Nelson are available year-round. Visitors can enjoy paved and off-road biking, equestrian, and hiking trails. Boating, canoeing, and kayaking along the river are also great ways to see the park. Anglers can fish along the riverbank or from a boat. The nature and history of the park come to life through exhibits and displays in the Elsa Kimbell Environmental Education and Research Center. Programs for the kids, or for the whole family, are also offered here. The park also offers two full-facility campgrounds and a youth/group primitive campground.